Tofu is not only a well-known ingredient, but it is also an integral part of Asian culture. “Tofu” is a book on tofu “poetry”. It aims at portraying the culture and imagery underneath the pure white surface of tofu. The book comprises two parts. The first volume, “Tofu Poetry”, collects poems on tofu from four Chinese dynasties: Song Dynasty, Yuan Dynasty, Ming Dynasty and Qing Dynasty. These poems convey a taste of their sentiments towards tofu. Covering the production process, the second volume introduces through words and illustrations how tofu is made traditionally. 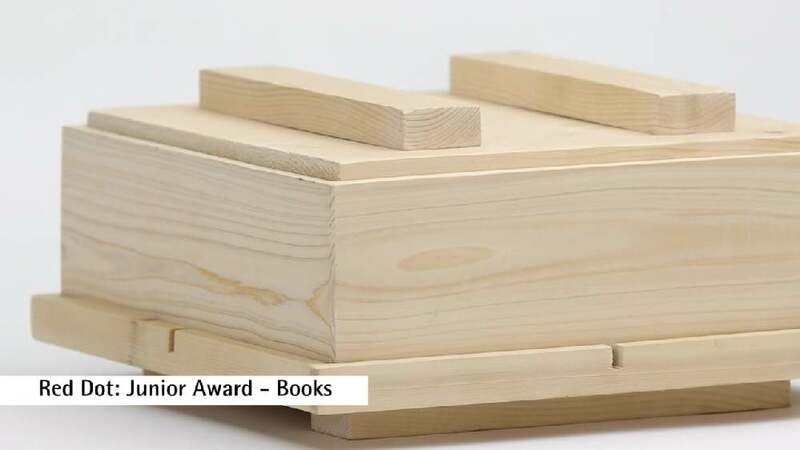 The two books come together in a typical wooden tofu box featuring different layers with distinctive square elements that reflect the simplicity and elegance of this foodstuff. The books showcase a zigzag fold that can be expanded into a large picture, turning one of them into East Asian style ink-painted landscapes that illustrate the complex process of tofu making, and the other one into a scroll that shows all poems side by side. “Tofu” surprises at first glance, because it does not look like a typical print publication, but comes in a wooden box used in traditional tofu production. How the different levels “unfold” on the inside to tell the story of tofu – in words and pictures – in the two plain, yet beautiful books is simply fantastic. The traditional culture and craftsmanship of culinary art are thus conveyed in the most subtle and knowledgeable manner.